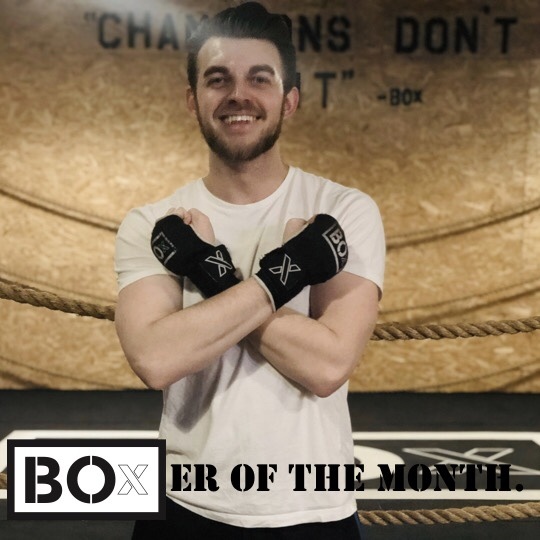 Our BOxER of the month in January was Bobbi. Bobbi is, and has been from day one, a really focused and determined BOxER. He told us from the get-go what his goals were and how he needed the motivation to get there. His boring gym training didn’t cut the grass anymore and quite frankly, results are what drives people. In fact, they’re what drives us too! We knew from the start Bobbi was serious about wanting to lose weight and tone up and he’s proudly done just that. Our job is to make each BOxER feel comfortable in our surroundings, to train with like-minded people and feel pushed like never before. Bobbi deserves this recognition because he’s changed his lifestyle, he’s made the adjustments he knew he needed to make to get the results he wanted and he’s focused in class. He’s a dream to train. A huge pat on the back from us for what is undoubtably a fabulous body transformation, well deserved. I moved to Leicester towards the end of 2016 for a new job and was a regular gym goer prior to that. But starting a new job and finding my feet in a new city caused me to neglect my fitness completely. I was working long hours and found myself eating more fast food (for convenience), which resulted in me putting on a bit of weight fairly quickly. I put it to the back of my mind and told myself that I’d join a gym eventually (that never happened). Fast forward to June 2017, I was invited by a work colleague to come along to a new Boxing fitness studio that had recently opened down the road from work. I wasn’t sure what to expect at first, but curiosity took me there. My first class was BOxBEAT… to say it was tough is an understatement. I was barely able to stay standing afterwards. But that didn’t discourage me and I’ve been hooked ever since! The BOxSTUDIO team are so welcoming and approachable. Whatever query or concern you have, they’ve got time for you. They push you to your limit in every class and you always leave with such a sense of achievement. I’m surprised at how well my fitness has improved in such a short space of time, but equally proud of myself at the same time for sticking to it. Thank you to the BOx Team.